Just a short post today as I really haven't had much time for solving much recently. A did manage to solve the second of the burrs that I bought from Junichi Yananose at the IPP in Paris and thought I should tell you about it. As you can see from the picture above it is a combination of a board and a stick burr (with some very odd sticks) and at Juno's table, it looked so gorgeous that I couldn't resist it even though I knew almost nothing about it. The name immediately makes you question it as it is a "pseudo" Ovolo when I did not even know what a real Ovolo was! Apparently the whole thing is down to my good friend Yavuz Demirhan who is one of the most prolific and talented puzzle designers in the world (over 500 published designs) and also a craftsman of considerable skill. Yavuz' Etsy store is well worth a visit. 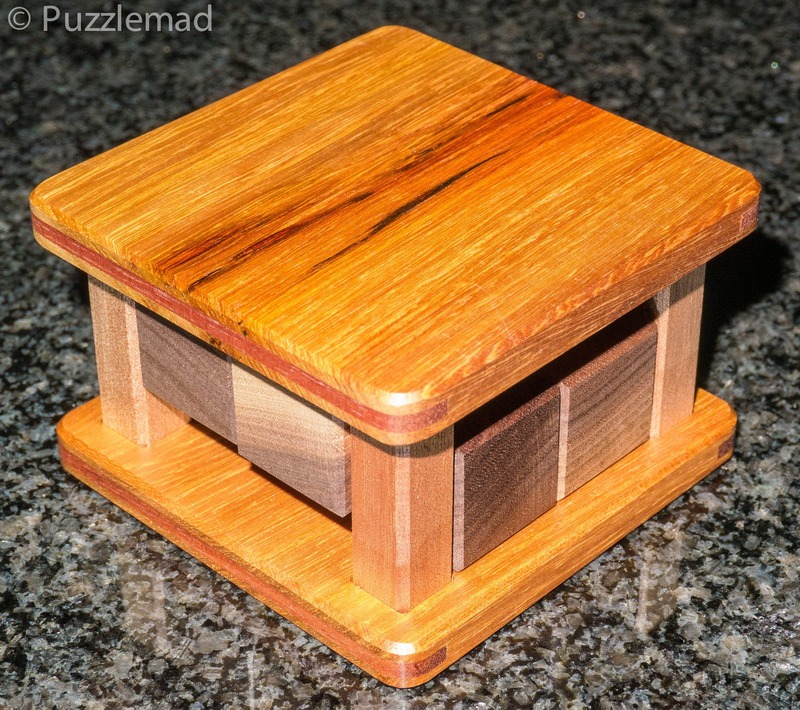 The Ovolo puzzle was designed by Yavuz in 2015 and was considered good enough that one of the world's foremost puzzlers, Brian Young, actually made this in wood and acrylic and used it as his exchange puzzle at the Kyoto IPP in 2016 - it is still for sale on Brian and Sue's store, MrPuzzle. I should probably pick up a copy soon! "He didn’t want to copy the shape of the puzzle and made a slight modification to the assembled shape. 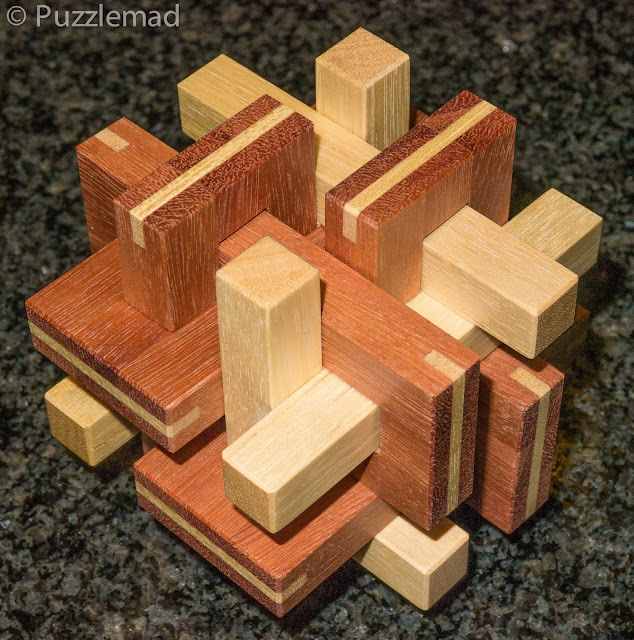 Now, what is the difference in the shape of the two puzzles? 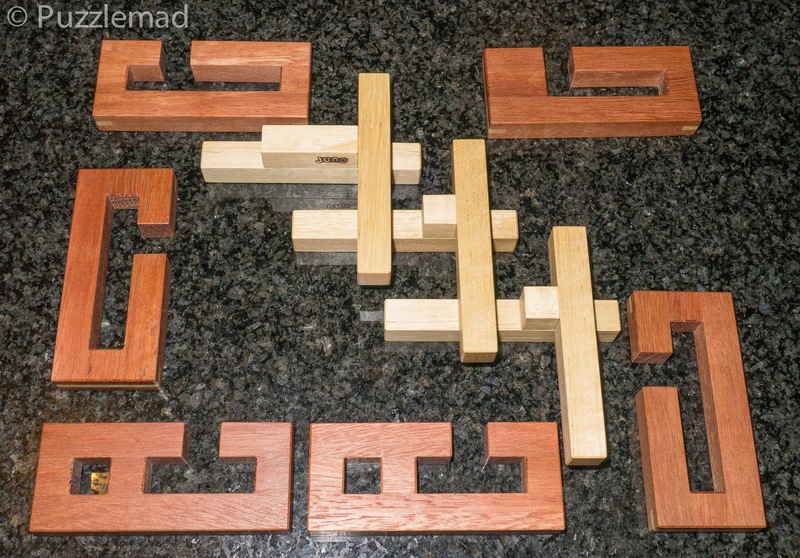 Both puzzles, Ovolo and Pseudo Ovolo consist of six sticks. Comparing the orientation of those six sticks in the assembled shape, the difference is obvious. Two sets of three sticks are used for Ovolo and those two pieces don’t touch each other. Three sets of two sticks are used for Pseudo Ovolo and the three pieces touch each other and make a loop shape." The original Ovolo is a level 5 solution but the Pseudo Ovolo was designed as a level 13 which to me is just the right difficulty level to be enjoyable (I can do tougher puzzles but I find that above level 20 they suddenly change from being fun to being work and I only choose puzzles of that difficulty if there is something really special about them). Juno made some modifications to the pieces to increase the structural strength whilst not changing the level of the puzzle (he added small blocks to the joins of the stick pieces to increase the gluing area). 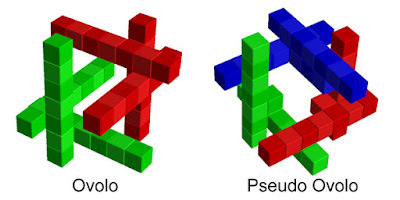 "Pseudo Ovolo is a very difficult puzzle because of its unusual transformation of the shape when it is assembled or disassembled. There are also lots of false movements to be disassembled." How could I possibly resist that? Plus I am a Magpie and I love puzzles of beauty - made from Karry and Silver Ash with reinforcing Splines on the board burr pieces, it is truly gorgeous and I knew it would look great on display. Picking it up to play with it, I realised that it is the perfect size too (87.5mm on each side) - it is easy to manipulate and to see what is happening inside. The level 13 did not particularly frighten me but what did was the huge amount of movement in the puzzle. It really slides apart a long way in several orientations without becoming unstable and without showing an easy solution. Unlike many board burrs there is no rotational shortcut because the pieces are held very captive. Just look at how beautifully made those pieces are and notice the branded mark! There is the customary branded mark that I mentioned on a previous blog post and the making of which was described fully by Juno on his own blog. We have 3 identical boards, a pair of identical boards and 2 identical sticks. The quality is stunning! The reassembly would be completely impossible for me from scratch but I had spent enough time on the disassembly that I had a reasonable memory and, more importantly, had a fairly good understanding of the structure. I managed most of the reassembly with relative ease until the last pair of pieces and realised that I hadn't paid enough attention to the orientation of all the pieces......Aaaargh! - it wouldn't fully go together. After an initial minor panic (I knew that I would be making a Burrtools file in any case), I persevered and actually had a very pleasant time working my way back to see where I had made my error. This was a really fun puzzle. It is also so tactile that over the next few days I enjoyed just taking it apart, scrambling the pieces and putting it back together again. I realised that I quite enjoyed this challenge and especially the fact that I could see inside and try to plan my moves/attack. 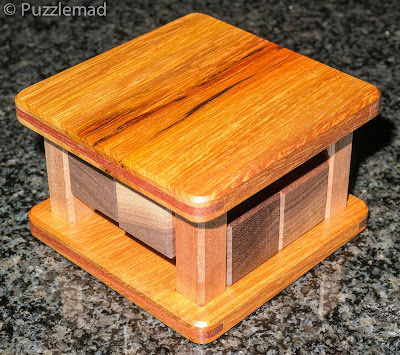 I enjoyed it so much that I bought another puzzle with a similar premise: The Visible Framed Burr also is supposed to be very tricky yet after a few moves it is possible to see all the pieces and how they can interact by peering inside - these puzzles are also good value with the conversion of the Australian Dollar to GBP being quite good. I can heartily recommend these puzzles - Juno is a great craftsman and Yukari, who runs the shop, is lovely to deal with. They have also just released a new new 6 piece burr "with a difference", the AMazing burr which looks great fun. I will definitely need to order one of those when my wallet has recovered from the dual shock of Eric Fuller and Brian Menold's recent dual releases. I hope you all enjoyed your weekend? Mine has been full of gym (at my advanced age I have to work to maintain my fitness!!) and chores, with no puzzling yet at all. Sob! Maybe this evening if I am lucky?